Before we begin I just have to say that I’m going to have a little trouble reviewing this film, because I don’t know if it’s physically possible to talk about a movie while jumping up and down with joy. I am of course here to talk about the much anticipated Marvel film, Captain America: The Winter Soldier, and normally when I review a film I like to keep people guessing as to my opinion, I like to jump between pros and cons, but with this film I have to come out and just flat out say that not only does this movie succeed as a thriller, an action film, and as a pure joy ride, but it succeeds at all of those things better than I thought it possibly could. I’ve been weighing all the parts of this film and I honestly can’t find much in here that didn’t have me grinning and applauding for hours. Now I know that some people out there might be cautious of this story, because the Marvel films have always been fun, and that’s what I love about them, they’re movies that make you stand up and cheer, they’re meant to be the definition of “crowd pleasers.” But for anyone who has read the comic, they know that The Winter Soldier is a gritty story, it’s a dark noir tale from the more serious sides of the Marvel Universe. So going into this movie I saw a lot of people on the net saying one of two things, either “Well they’re going to make it too fun and it won’t be as dark as the real story,” or “I’m nervous that this will be too dark and not as fun as the other movies.” Well I know that I’m only speaking for myself, but to me, this movie easily achieved both of these tones. Yes, this film gets serious, it gets intense and chilling and there are indeed some dark moments. But at the same time there are lots of jokes, there are great one liners, there’s amazing super heroic actions scenes that make you want to cheer. And here’s the thing that I really enjoyed about this movie, it strikes just the right balance between those two tones. When it sprinkles in a joke into a tense moment, it doesn’t interrupt that moment, in fact I’d say about 90% of the jokes in this film help ease all the tension through and keeps it from building up too much, making this a movie that is serious but not so heavy that it wears you down. This movie is two and a half hours long but because of this great balance and the wonderful pacing of this film, it flows so well that not once did I find myself bored or thinking that there was a scene I could have done without. But a good story doesn’t mean a lot if you don’t have a good cast, and this movie has a fantastic cast. This movie in a way is its own miniature Avengers film, because once again it features a team of characters that we’ve come to know and love, along with some new faces, coming together to create something special. 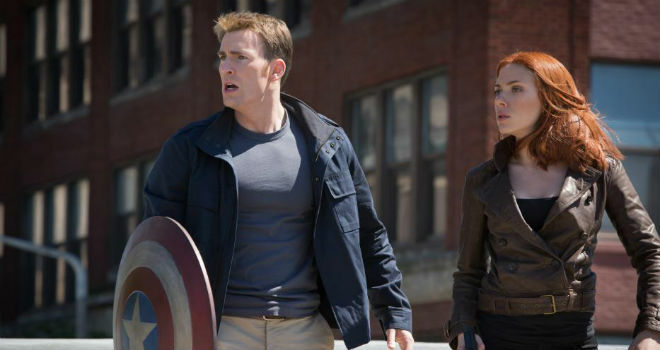 Chris Evans returns to reprise his role as Steve Rogers aka Captain America, and I will admit that in the first movie and the Avengers I thought he was alright. I liked him but I wasn’t as bowled over by him as I was with some of the other actors, but in this one I finally looked at him and went “Now that’s Captain America.” The same can be said for Scarlett Johansson, her version of the Black Widow is somewhat different from her portrayal in the comics, but with this film I was finally able to fully form the image of this cinematic Black Widow and I feel like I really got a good three dimensional view of her character. As far as the SHIELD agents go, Nick Fury (Samuel Jackson) is at his all time best in this film, I’ve always said that when making a team movie you need to be able to see why each person has the job on the team that they do, and with this film you really understand why Nick Fury is the biggest super spy in the world. And I’m a big fan of Maria Hill (Cobie Smulders) and while I did want to see much more of her, she’s very good in the few scenes she has. And as great as the returning cast was, the new additions are the real stars of this film. Anthony Mackie joins the cast as the Falcon, and he brings a sense of maturity and charisma to this role that not only lets him stand shoulder to shoulder with Cap, it’s also going to make that character a break out hit. As I was watching this film you could feel all the kids in the audience deciding in unison that they wanted to be the Falcon for Halloween. Anthony Mackie has said that he doesn’t know yet whether or not the Falcon will be in the Avengers 2, and I’d like to speak on behalf of everyone in that audience when I say “Marvel, put the Falcon in Avengers 2,” because if you went into this film wondering how could a guy who just flies around stand next to Thor and Iron Man, the aerial combat scenes in this film will easily answer that question. I’ll even take it one step further and say that the Falcon is going to be such a hit, that if Marvel doesn’t announce a Falcon ongoing comic within the next four months, I’ll eat my hat. 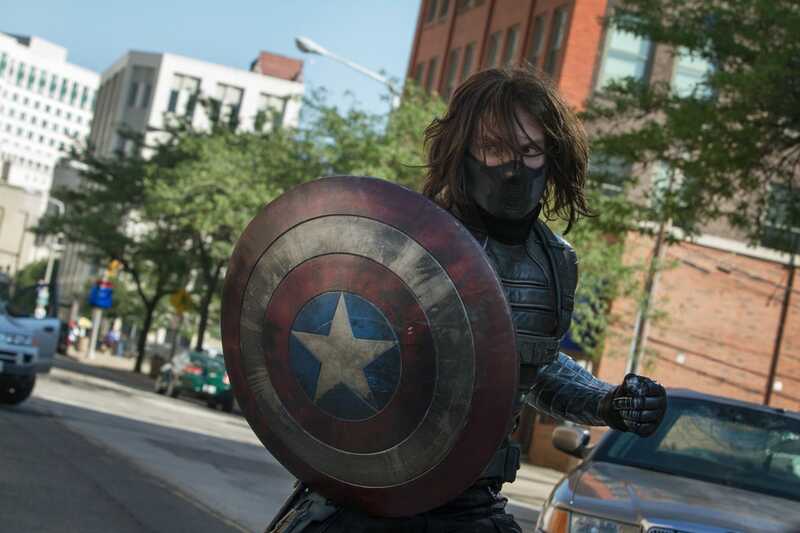 Perhaps the hardest role to portray though would have to be the Winter Soldier himself, a tortured figure who is still a complete mystery and a powerful weapon. Personally I believe that this movie handled that portrayal better than I could have expected. Everything from the way he fights, the way he handles a gun, to the stare in his eyes shows off what a threat this man is. There are shots in this film of him just firing and reloading his weapons with this cold, almost machine like demeanor that would put the Terminator to shame. And a lot of this menacing persona is created with the help of the score. I’ll admit that while I enjoy each of the Marvel films, the scores were never the strongest parts of them to me. But the theme song that they created in this film for the Winter Soldier is chilling. It’s like a screeching machine set to heavy beats that will instantly creep you out and perfectly captures the feel of this character. And he’s just one of the villains that are wonderfully portrayed in this movie. I can’t go into who else is here because it would spoil some parts, but let’s just say by my count there are four villains in this film, and it balances each of them perfectly. So many super hero movies stumble when they decide to include just two villains, this one has four and makes them all work together like clockwork. Before I finish this review I can’t leave without bringing up one last thing, and that is the action. I’ve mentioned a little about the action throughout this review, but it’s so impressive I really must take a moment to give it its own praise. This film shows a combination of live hand to hand combat (mostly performed by Chris Evans) and CG heavy aerial action scenes (mostly performed by Anthony Mackie) and both of them are handled with expert choreography. When the Falcon is flying in the air the effects are truly dazzling and go a long way to help make that character such a star in the film, and the hand to hand combat scenes make you really impressed with how much training these actors went through. My only possible complaint about the fight scenes is that the camera work is much in the style of the Bourne films, using quick cuts and shaky lenses, and I know a lot of people like that style but it’s never really been what I personally enjoy. However, after the first series of fights in the opening scenes, it stopped bothering me and I quickly got used to it, and I think that says a lot for how well the directors used this technique. This was directed by Anthony and Joe Russo after all, the directing duo known for directing the Paint Ball episode of Community, so you can trust me when I tell you they know how film action (not to mention how to blend comedy into their action scenes). I know that I’ve been incredibly positive in this review, and I have spent most of this time talking about what I liked about the film, but that’s because any and all problems I might have had with this movie were so small and so nitpicky that they either barely registered with me, or by the end of the film I had completely forgotten about them. Once again Marvel has created not just a great super hero movie, but a great movie in general. I would greatly like to thank them for inviting us to come to this special screening, hosted by Nick Lowe and Joe Quesada who were able to keep the audiences up and energetic, all while having some good natured fun with everyone, including themselves. So thanks to them and thanks to the audience that came out and provided so many gasp, and laughs, and cheers that it let me know that even if you aren’t a comic book expert who knows these characters, this is still a great filmgoing experience.